Two spindle semi-automatic benchtop coil winding machine with digital controller for winding small inductors, gas ignition coils, solenoids, motors and sensor coils WH-800i. Spindle drive - High torque brushless DC induction motor producing a max torque of 78.5 Ncm. The wire is fed via separate wire tensioning units, and guide tube type feeder heads. Each winding head is fully adjustable so that winding may be carried out simultaneously on both spindles. Coils wound with a single wire size, including ignition coils, solenoids, relays, motors and other inductive devices. 2 x wire guide tubes, 2 x tension units and cover tape attachment, footswitch, and comprehensive manual. 6000 and 3000 rpm versions available. 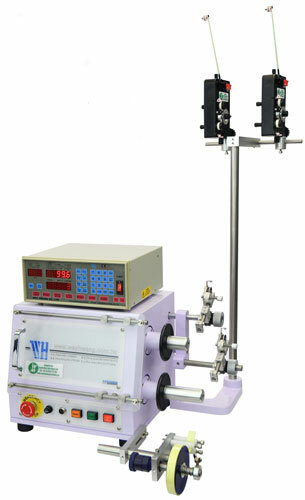 The WH-800i is a compact, high speed two spindle benchtop coil winding machine with digital controller for semi-automatic operation. It is ideal for use in the production of small inductors, particularly bobbins wound with a single wire size. The high maximum winding spindle speed (up to 6000 rpm) enables coils with a high turns count to be wound in a short cycle time. Typical applications for the winding machine include the manufacture of gas ignition coils, solenoids, relays, motors and many forms of sensor coil in small and medium batch quantities. The guide tube type wire feeder heads are fully adjustable so that coil winding may be carried out simultaneously on both spindles, and wire tension is controlled by means of a wire tensioning unit. The cover taping attachment conveniently mounted on the machine allows this operation to be carried out efficiently during the winding process with the minimum of handling.